I don’t know about you, but this time of the year when Jelly Beans hit the stores, they find their way into our house. Then will all the Easter hunts and celebrations even more Jelly Beans enter our home. 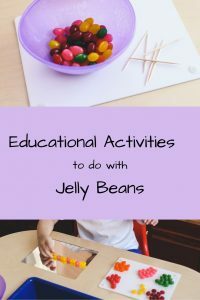 I wanted to give you some fun and educational ways to use Jelly Beans with your kids. 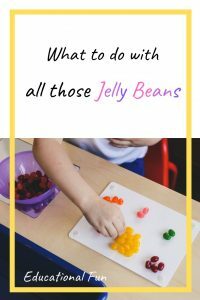 First up, you are going to want to give your kids a chance to explore the Jelly Beans. We talked about the Jelly Beans, exploring them with our senses. That of course included eating some. It’s fun to introduce new words to your kids and depending on the jelly beans you pick, there may be some stinky or strong smelling ones. These are really great for kids 4 and up to build on more adjectives when describing smells. As you are touching and tasting you can discuss what you see. It’s fun to take bites of Jelly Beans and see the soft center and crunchy outside shell. Izzy loved that part! We discussed the colors, shapes, and unique Jelly Beans. We found a few that were two stuck together. 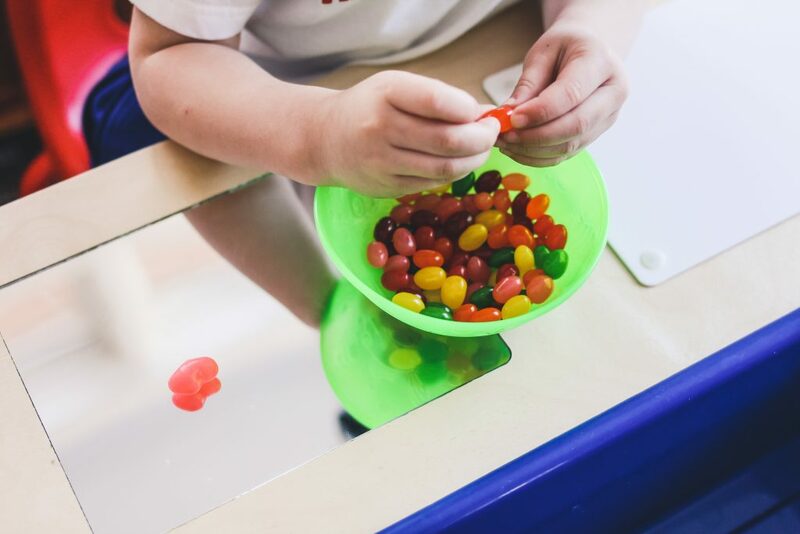 Our science table from children’s factory has two spots where we can magnify our Jelly Beans and get a closer look of them whole and after taking a bite. Don’t forget about smell. We got the sweet starburst Jelly Beans, however if you get the Jelly Belly’s then you will have a must larger discussion about scent and taste. Sorting is an important skill for young children. It’s actually an early math skill and building block to many math concepts. Basic sorting requires the ability to sort based on one difference. In this case, all of the jelly beans are “mostly” the same shape. The one difference to sort by is color. If you get 2 types of Jelly Beans, the nest level of sorting would be adding another difference. So your child could sort by color and size. They could put all the pink ones together, big and small – then sort out those to a pile of big pink and little pink. Note: Mastery of sorting by 1 difference is needed, before moving on to sorting by multiple differences. Note: When introducing patterns to your kids, remember that you should start with AB patterns. 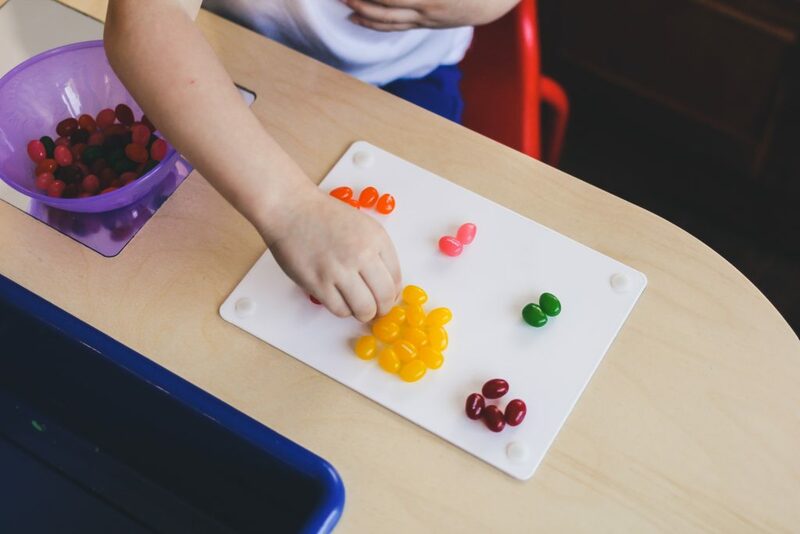 Creating patterns is another early math skill and another concept that builds the foundation for more complex math concepts. Once your child can do this, work with them on creating their own pattern. You can start by asking what 2 colors they would like to use. You can then model it, by starting the pattern for them. They may catch on quickly and want to do one completely on their own. For added fine motor fun, you can have your child create a pattern on a toothpick. 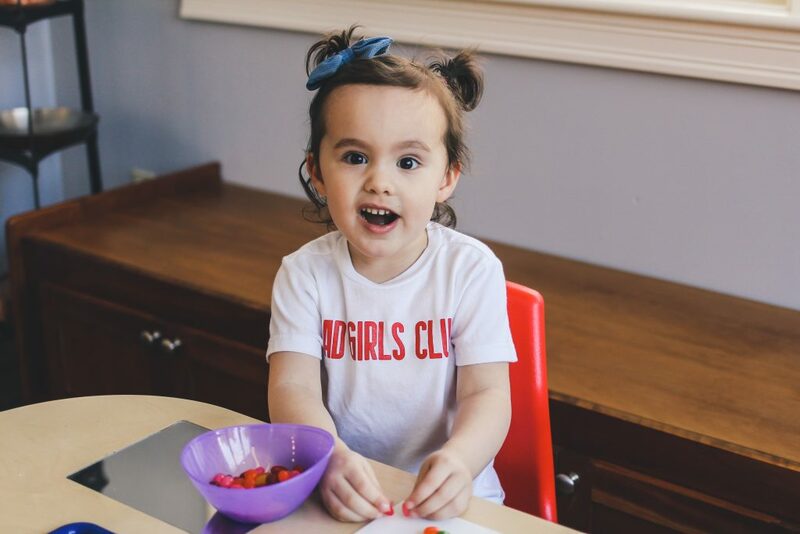 Once your child is an AB pattern pro, like Izzy, you can move on to more advance patterns such as ABC, AAB, AABB and ABAB. Ready for more advanced cognitive and fine motor growth? Bring tooth picks in to the play. 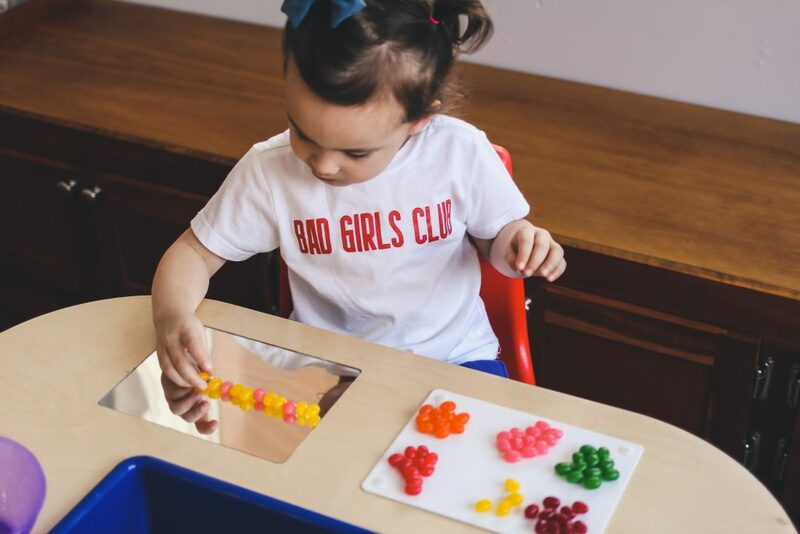 I can’t believe I need a disclaimer, but in this day and age… guys, just be sure to monitor your kid(s) with the tooth picks.Shape recognition is another early math skill. Shape recognition does not require the child to be verbal. 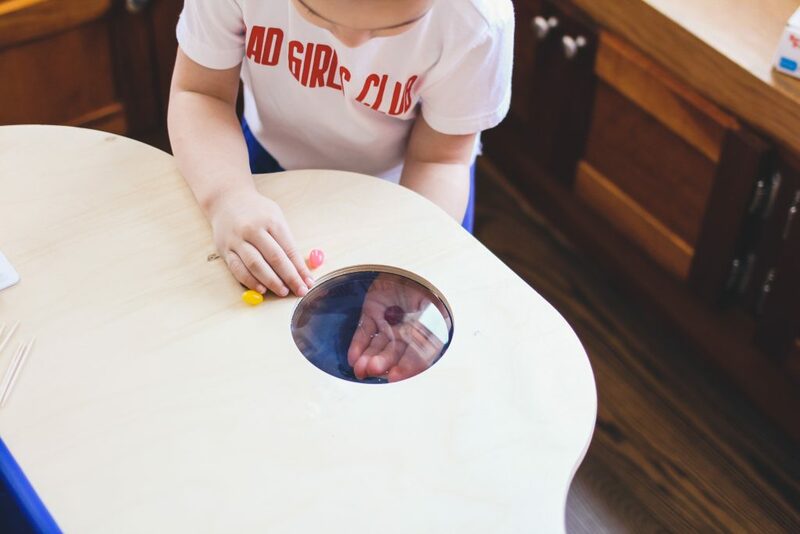 To see what shapes your child knows you can hold a few shapes in front of them and ask, “Which one is the circle?” or “Point to the circle.” This way, if your child is non verbal or has minimal words, they just need to point to the correct shape. 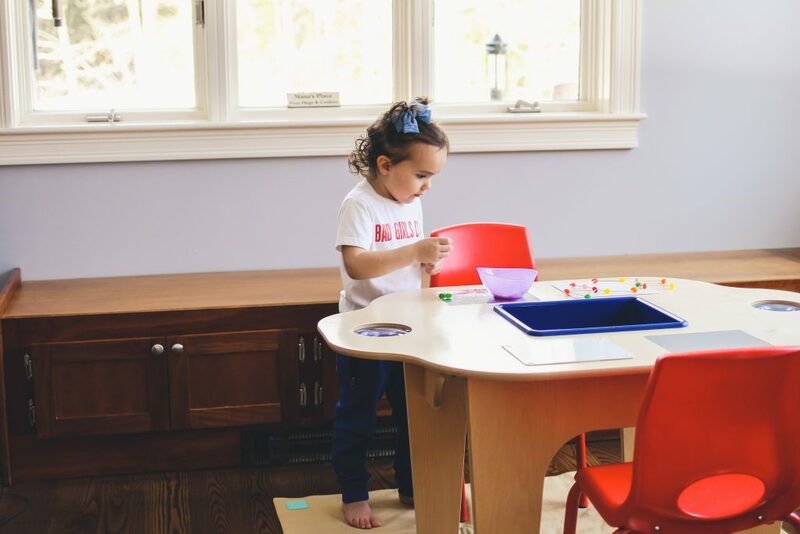 You can also line 3 shapes up on the coffee table and say, “Bring me the circle.” This envolves their whole body and keeps them active while you work on shape recognition. 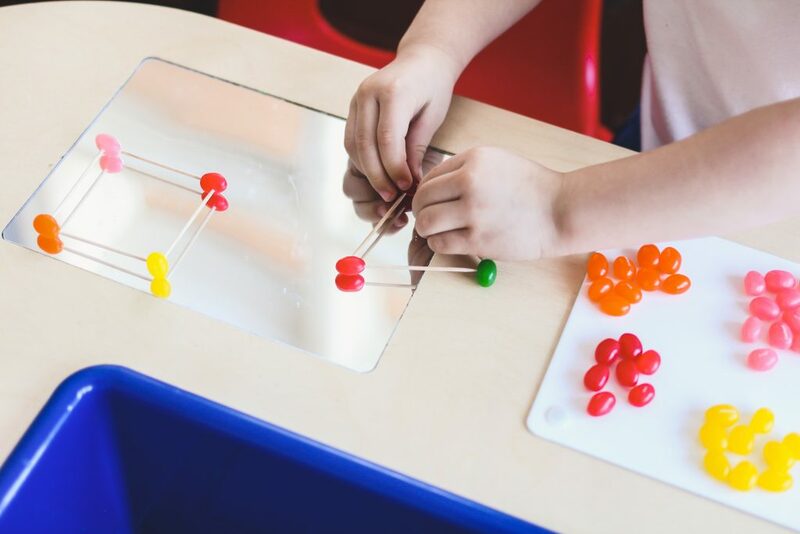 If they bring the wrong shape, say, “Try again” or point out the correct shape and say, “This is the circle.” You can take it another step further and count the sides of the shapes with your child. 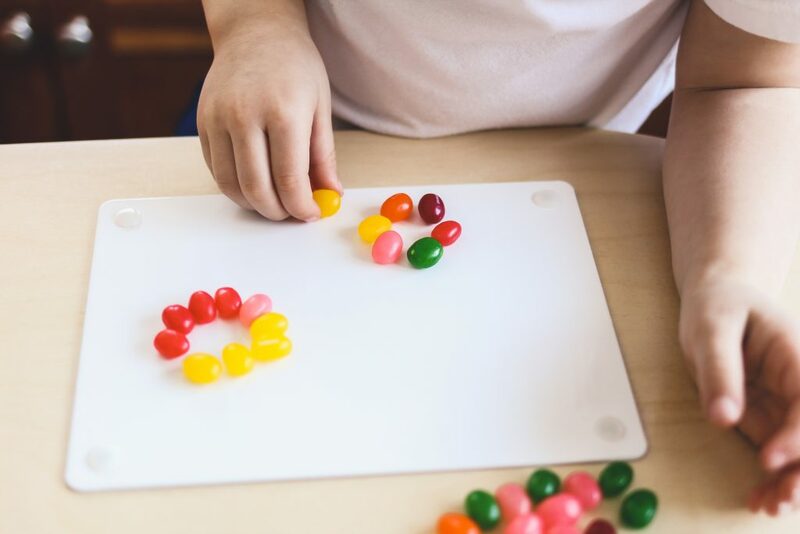 I did this with Izzy at as young as a 10 months old (not with Jelly Beans, but I’m sure you can see how you can use this activity in multiple ways, not just shapes made from Jelly Beans). To take it another step further, you can use tooth picks to creat the shapes and really discuss the sides (tooth picks) and how many you will need. With that you can work on counting skills. Izzy is almost 4 and we have been doing a lot of work on writing letters and letter sounds. 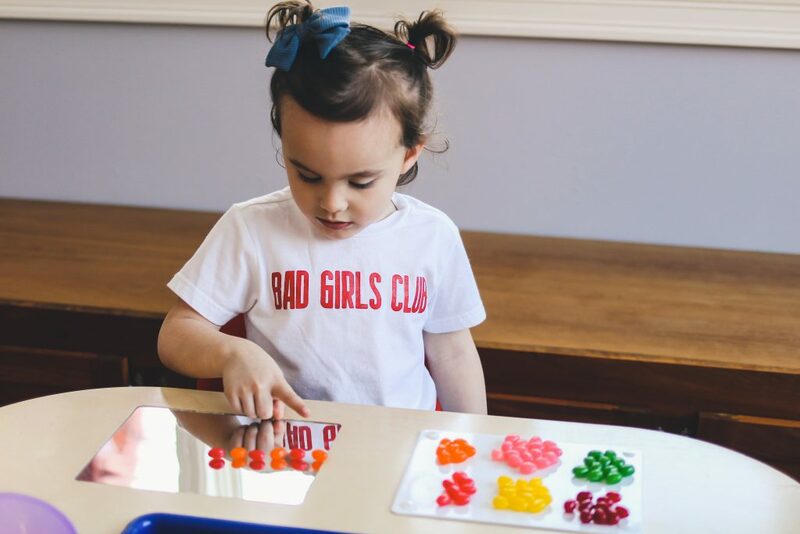 If your child is at this level, go ahead and have them create letters. 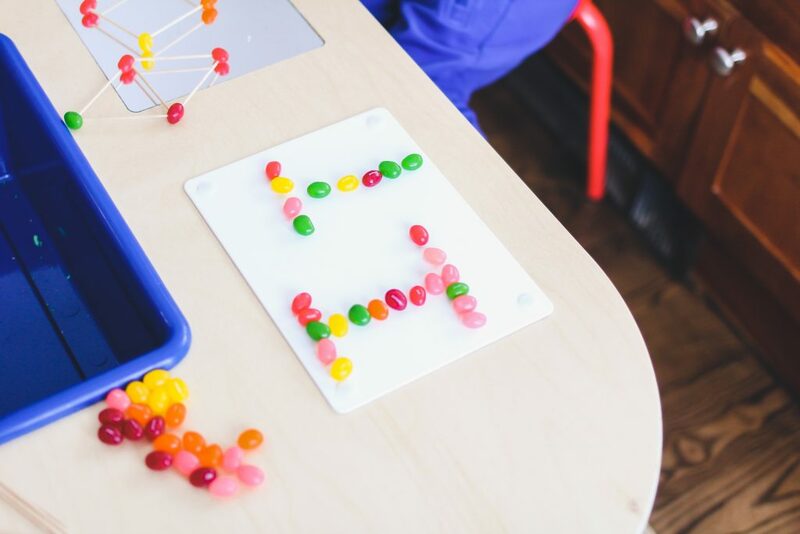 For beginners you can model it, by creating a letter with Jelly Beans and ask the child to copy you. Break it down slowly for them. Example: For letter L you would say, “We are making a big line down.” As you say that, make your big line down and encourage your child to help you or create their own next to you. Then tell them the next step, “Now we need a little line across, at the bottom.” Again show them how you are creating a line at the bottom to finish making letter L. You can again encourage them to build it with you are create their own next to you. 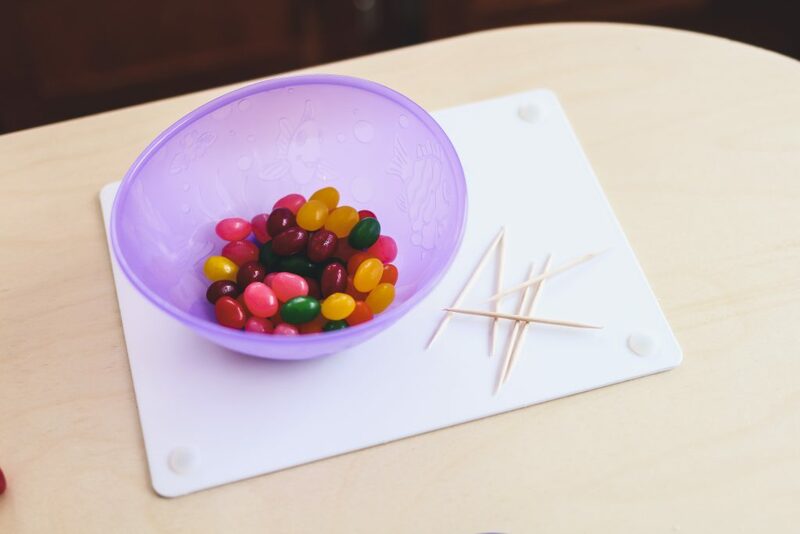 You can also write a letter on a piece of paper and have them trace the letter with Jelly Beans. Be sure to talk them through the steps, so they remeber these for handwriting. Example: For letter “B” is Big line down, little curve, little curve. **For more support with handwriting and the correct steps for writing letters check out Hand Writing Without Tears. I used that with students and it’s a great, hands on program used to teach handwriting. you always have the best ideas!!!! My kids would love this!